Since it’s Throwback Thursday on Facebook, I thought I’d do a little throwback myself here. 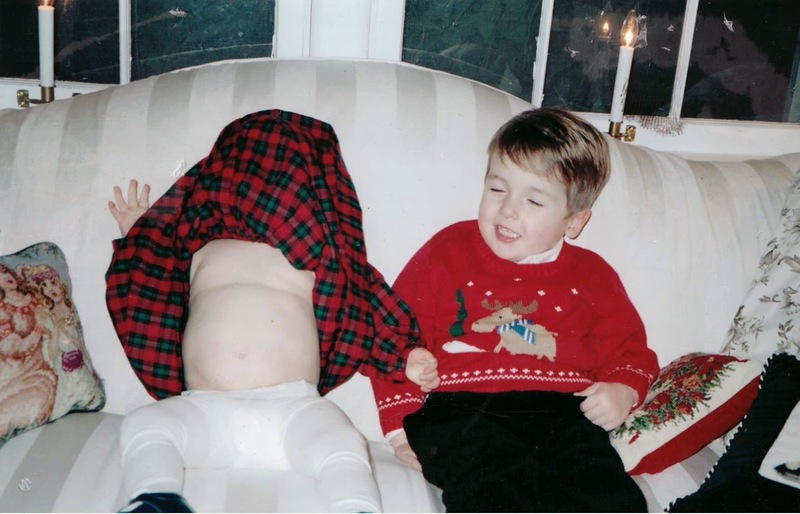 Quite possibly my favorite Christmas photo ever. Will was 3, Little Meems 17 months. Every time I got ready to snap the photo, she’d pull her dress over her head. Every. Stinkin. Time. All I wanted was to get the perfect photo of my perfect children for my perfect Christmas cards. I did finally get a good photo, but upon further inspection realized Meems’ nose was running and crusty and Will had a scratch down his cheek. So I Photoshopped them to perfection and sent the card. Big sigh of relief. That was relatively new mom me. That was the girl who used to stress because she didn’t have all of her good china or any chafing dishes (seriously??!!) and her daughter’s tights got a snag in them right before the photo. That was the girl who had the perfect family and the perfect house and the perfect job and the perfect life. Babies napped, no one talked back, happiness was a trip to the playground. Happy, happy, happy. Perfection, perfection, perfection. That's what I wanted to believe (and wanted you to, too). A third child came along and my attitude completely changed. Nice and tidy and perfect became "it is what it is" with a healthy dose of humor and humility. I realized perfection was too stressful. My children are older now and there is never a shortage of stress, some of it BIG stress. Perfect Christmas cards can no longer compete. Nor should they. I look at this photo and I admonish myself for not just going with the flow and having a sense of humor. It is what it is. The way they belly laughed every time she did this – that’s what I remember when I look at this precious photo of my precious babies. She was so impish when she was little and this photo portrays her personality so precisely. And she was full to the brim with personality. I’ve learned, in those many years since then, to let go of that picture perfection. Or rather, to try. My years of holiday cards are a testament to that. I look back and in nearly every one, Meems’ personality is on full display. Mouth open, smiling with her whole face, her whole body and being. Kids’ hair needs to be cut, shoes are untied, brothers are making faces, mouths have food in them, someone is throwing a temper tantrum, someone has a neon green cast, Tate is even wearing gogo boots with his jeans in one. Because Tate. Because of course. Better than perfection? Joy. Happy, laughing children. Letting go. The giggle-laced trips down memory lane. My life isn't perfect. My home isn't perfect. My kids aren't perfect. What you see on my cards is what it is. That's life with these munchkins folks. And, to me, that's perfect. Couldn't have said it better myself...love this photo!